It's so trendy among movie cynics to say that The Hunger Games is just a copy of the supposedly better movie Battle Royale that it's actually become a commonplace, and mainstream reviewers have been forced to make reference to the similarities. I guess all the film hipsters out there haven't seen or have just forgotten about The Running Man (1987), one of the ever-plentiful Schwarzenegger stupidity machines created in the 80's and 90's. This is part of a series of movies with enough recognition to warrant a feature film parodying them. So where are the trendy name drops? This movie might not be as good as Battle Royale—the cinematography is pretty bland, the writing is relatively poor, and the characters are defined by little more than their muscles—but it's certainly not without its own merits. 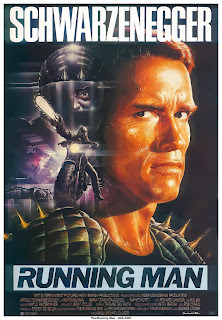 And on top of that, The Running Man is more thematically similar to The Hunger Games than the Japanese slasher flick. So let's take a look at some of the similarities. The central parallel between The Running Man and The Hunger Games is their element of a reality television show in a dystopian future. In The Hunger Games, 2 tributes are chosen from each of 12 districts every year to fight to the death in a televised broadcast to remind the masses of the dangers of rebellion. The Running Man broadcasts its titular television show with a much more modest explicit goal: pure entertainment. A single contestant or "runner" must escape or conquer a series of opponents or "stalkers". In both cases, the broadcast serves more or less openly as a means of keeping the subjected masses docile and preventing revolution. While both films contain an interesting portrayal of class conflict, to a disturbing extent each also is the thing it criticizes. They are both escapist fantasies which allow audiences to temporarily ignore the conditions of their oppression. But let's be real for a second: the vast majority of movies also do this. Should these two be punished simply for being more hypocritical than others? It depends on how you look at it. On the one hand, the idea that escapism is a condition of success for tyranny is a valuable message, and both films depict their respective broadcasts also as possible vehicles for resistance. In this view, these movies should be praised for at least making plain the purpose of their medium. But on the other hand, this is also the perfect formula for stagnation. If movies are a perceived as a valid method of resistance, more people will go to see them believing themselves part of a radical act. I don't have an easy solution to this dilemma, so, I don't know, go watch a movie or something. - I also discuss this problem in my review of The Hunger Games: Catching Fire. - This movie is an absolute bad-action-movie-pun machine. By my count there are at least 5 silly one-liners spouted by Arnold before or soon after he vanquishes his various opponents. - Wait a minute, this movie came out the exact same year as the original Predator and didn't become the more popular of the two? How does that work? I bought this movie on DVD a few years ago, but I'd rented it out before that, mainly because I'm a Schwarzenegger fan and I've seen all his stuff (except for the Conan movies). This movie is neither good nor bad in my opinion. It's just silly, and I guess that's fine by me. I can recognise the similarities to 'The Hunger Games' (e.g. reality TV death sports), and there's a movie called 'Death Race' which might also interest you - I've only seen the remake, but it's decent and has fun with the same themes. If you've read the book 'The Running Man' by Stephen King, you might have been disappointed, or you will be if you tackle it. I consider it garbage writing, with little to do with the Arnie vehicle. Maybe I'm being a little harsh - the book is different and could be adapted well into a movie, but I found it tedious overall. Oh I've also only seen the Death Race remake, but I hear the original is hilarious and entertaining! I've been meaning to watch it since they talked about it on Screen Junkies a few weeks ago. It's interesting to hear that the writing itself was questionable and the lack of quality wasn't entirely Arnold's fault. Also, to be honest I do enjoy his performances, but it always has a bit more of the "laughing at the movie instead of which it" aspect than I'd like.